My friend Sue and I are now in the second week of our linguistic tour of northern Spain. Yesterday we hiked up to the fortress overlooking the city of Burgos and its Arlanzón River, and thus back in time to the early centuries of the Reconquista (details here). Today’s two excursions, to the Catedral de Burgos and the Monasterio de las Huelgas, carried us forward several centuries, through the era of El Cid, the political consolidation of most of Spain, and the successful pursuit of the Reconquista. The Cathedral is built on a site of great linguistic interest: in 1080, the Council of Burgos took place in an earlier church at the same site. As described in this previous post, the purpose of the Council was to enforce the use of the Latin Mass in place of the vernacular that had sprung up in Spain. While touring the Cathedral today, I learned that just one year later, in 1081, the city of Burgos became the official seat (sede) for the province’s bishopric, or diocese. Clearly the Council had increased the city’s prestige: language matters! The first Cathedral of Burgos was built over the next fifteen years. 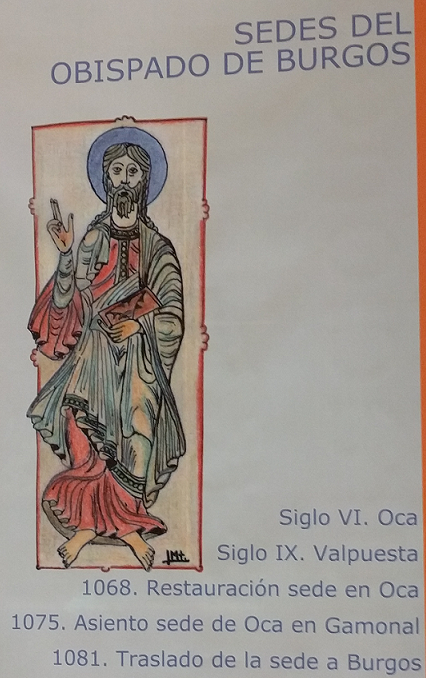 Informative sign from Catedral de Burgos, showing establishment of Burgos as religious seat one year after the Council of Burgos. 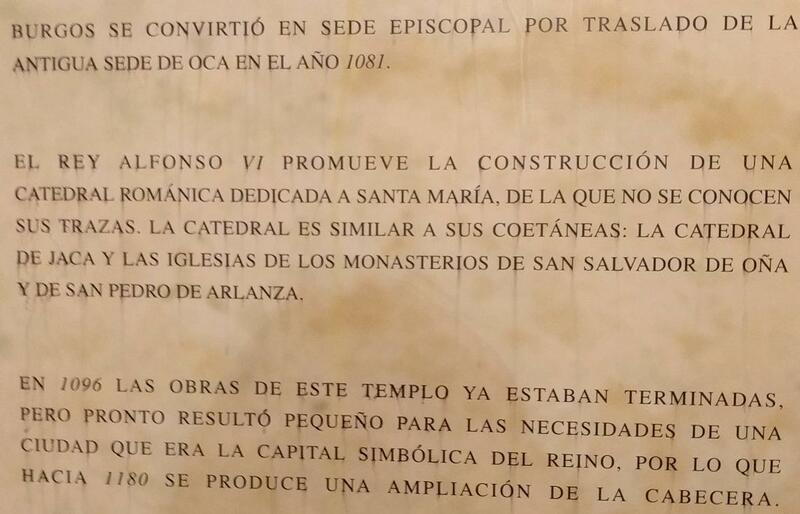 Another informative sign, dating the original Cathedral to within fifteen years of the Council of Burgos. Today’s Cathedral is of further linguistic interest because it houses the tomb of El Cid, the Reconquista hero of the epic poem that is the first known work of Spanish literature. 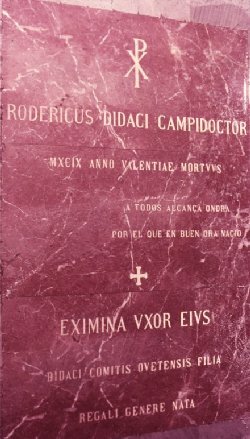 The tomb’s inscription includes the Latin version of El Cid’s name (Rodrigo > Rodericus) and that of his wife, buried with him (Jimena > Eximena). Above the cross you can also see a key line from the poem: a todos alcanza honra por el que en buen hora nació: very roughly, ‘everyone gained in honor because this good man lived’. Our second touristic destination of the day, Burgos’s Monasterio de las Huelgas, fast-forwarded us less than a century to the year 1187. The Monastery was founded by Queen Leonor, the British-born wife of Alfonso VIII of Castilla, and serves as a pantheon, or royal burial place, for this couple and their descendants. By Alfonso’s reign the Reconquista was going full blast, carrying the Castilian language with it. 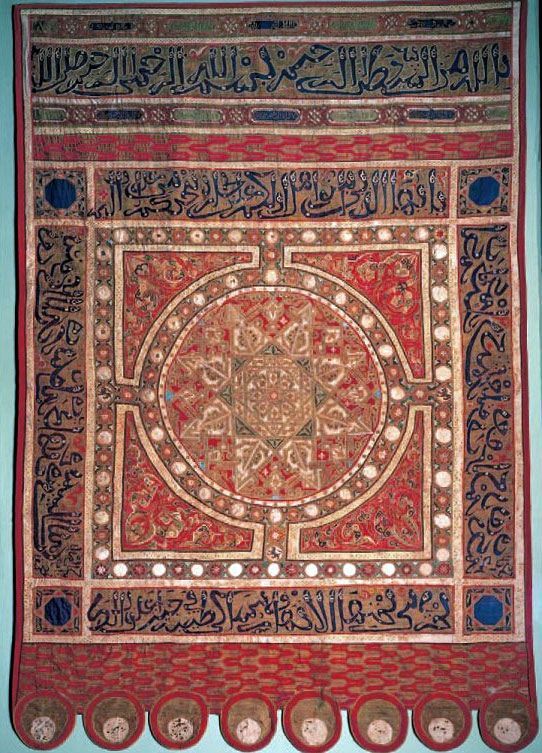 The Battle of Las Navas de Tolosa, a turning point in the Reconquista, took place in 1212; a spectacular door hanging from the tent of Alfonso’s Moorish opponent, Muhámmad al-Násir, hangs in the Monastery’s Museo de Ricas Telas Medievales. It is a harbinger of the eventual fall of Granada at the hands of Alfonso and Leonor’s descendants, Ferdinand and Isabella, and thus the final victory of Castilian Spanish. 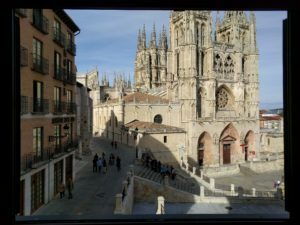 This entry was posted in Linguistic tour of northern Spain and tagged Burgos, Catedral de Burgos, El Cid, Monasterio de las Huelgas, Spain, Spanish on 21 June, 2016 by jhochberg. Today my friend Sue and I got to know Burgos better. 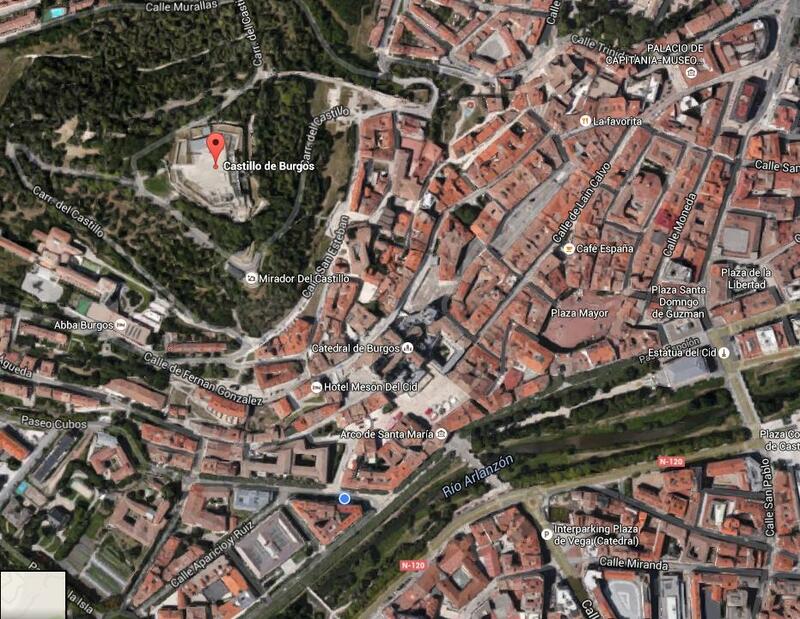 Our day involved two walks: the first to the Cartuja de Miraflores, a monastery whose location is marked with a red arrow in the picture below, and the second to the hilltop fortress Castillo de Burgos, from which this picture was taken. Near the center of the photograph is Burgos’s Plaza Mayor, marked by the colorful row of pink, yellow, blue, and white buildings. We found this a welcome change from the more uniform (though more ornate) plazas of Madrid, Valladolid, and especially Salamanca. You can see the spires of the cathedral to the right, almost hidden by the trees. We reached the Cartuja de Miraflores by walking along the Arlanzón River, marked by the ribbon of green running diagonally through the middle of the photograph. (We followed these walking directions, posted on TripAdvisor.) This monastery belongs to the contemplative Carthusian order. We spent over two hours studying the famous altar and other works of art and architecture in the building. The pathway along the Arlanzón is part of the pilgrimage route to Santiago de Compostela. We spotted several pilgrims, easily identified by their heavy backpacks and scallop shell insignia. Scallop shell markers embedded in the pavement also mark the portion of the trail that runs through Burgos itself. As I described in an earlier post, Burgos’s position along the Camino de Santiago helped bring the city into prominence. Our afternoon excursion to the Castillo de Burgos was a deep dive into the history of Burgos — and Spain. Castillo in this case means ‘fortress’ rather than ‘castle’, and this particular fortress was constructed in the late 9th century, during the Reconquista, or the Catholic reconquest of Spain from the Moors. Its construction was part of a deliberate effort to rebuild a Catholic population in the area as the Moors were being driven south. The city of Burgos thus began on the slopes of the hill, protected by the castle above, and slowly spread downhill toward the Arlanzón. This meant that its growth followed the opposite pattern of London, New York, and Paris, which began with riverside settlements, then spread outwards. Ironically, as the Reconquista progressed Burgos spread so widely that the Castillo became irrelevant. A series of unfortunate events, culminating in the French occupation of the fortress during the Napoleonic War, then severely damaged it. It has only recently been excavated and partially rebuilt. Sue and I heartily recommend both these excursions to anyone who comes to Burgos. This entry was posted in Linguistic tour of northern Spain and tagged Arlanzón, Burgos, Cartuja de Miraflores, Castillo de Burgos, Reconquista on 20 June, 2016 by jhochberg. I titled this post last week, before leaving for my linguistic tour of northern Spain with my friend Sue. 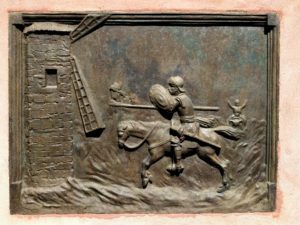 As it turned out, our visit to the Museo Casa de Cervantes in Valladolid was not the high point of the day, though we did appreciate its peaceful garden, and the reliefs depicting scenes from Don Quixote, such as this one. The museum is located in the building where Cervantes lived from 1604 to 1606; the first volume of Don Quijote was published in 1605. Valladolid was our stopover en route from Salamanca to Burgos, and well worth a visit. Its star attraction is the Museo National de Escultura, an extraordinary collection of medieval, Renaissance, and Baroque religious sculpture housed in a magnificent convent. My favorite sculpture depicted Saint Anne and her three husbands (!!!) with the Madonna and Child. The husbands were carved with great individuality and detail. 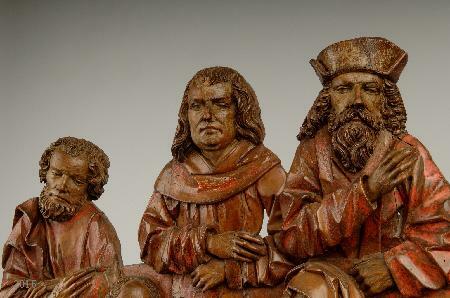 Sculptural detail: the three husbands of Saint Anne. While in Valladolid i noticed this nice example of the arroba neutra: the contemporary and controversial use of the @ sign in Spanish to create suffixes that are neither masculine nor feminine suffixes. 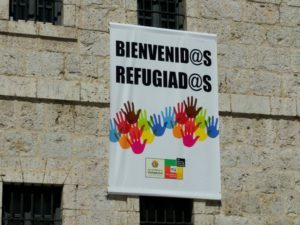 (The sign translates as “Welcome refugees”.) Anybody know how something like this is pronounced out loud? After leaving Valladolid it was exciting to arrive in Burgos, since this was the city that inspired my trip: Burgos is the cradle of the Castilian language (though in Salamanca we were told it was Salamanca!). Our hotel directly overlooks the city’s cathedral. 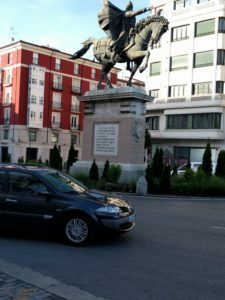 Five minutes’ walk away is the famous statue of El Cid, Burgos’s hometown hero, which turns out to be in the middle of a busy traffic circle! I found this rather undignified. All the photographs I’ve seen of it show the Cid silhouetted against the sky, perhaps with a bit of building. Now I know they were carefully composed. El Cid and his horse in Burgos, juxtaposed with more modern transportation. 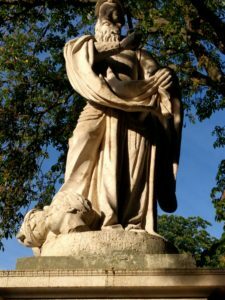 This entry was posted in Linguistic tour of northern Spain and tagged arroba neutra, Burgos, El Cid, Museo Casa Cervantes, Museo Nacional de Escultura, San Millán de la Cogolla, Valladolid on 20 June, 2016 by jhochberg.